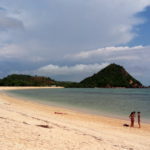 I am sure many travellers and backpackers have asked themselves if Lombok is to be included in the itinerary. Can it substitute Bali? Is it worth exploring? Bali or Lombok? Or both? White sandy beaches, blue-green water and perfect sunsets- that’s how I had imagined Bali! I was disappointed to say the least but I found all of these, not in Bali but in an island a little away from Bali- Lombok. Hence, this article will sing praises of this unearthly beautiful island and why you must visit it right away. All pictures in this blog are real pictures. Don’t get me wrong. Bali is quite unique in its own way. 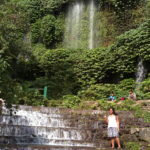 Bali’s temples, cliffs, nightlife and a range of activities attracts tourists from around the world and I must admit right away that all of these are quite wonderful. In fact, if you wish to go temple hopping or enjoy crazy parties or chill at a beach café during sunset or take part in water sports, then Bali has it all. In fact, if you are going to Bali, you should definitely make a trip to Tanah Lot and Uluwatu like Mario did. What it mostly lacks is untouched nature, breath-taking beaches, gorgeous waterfalls and a sense of tranquillity that calms the soul. 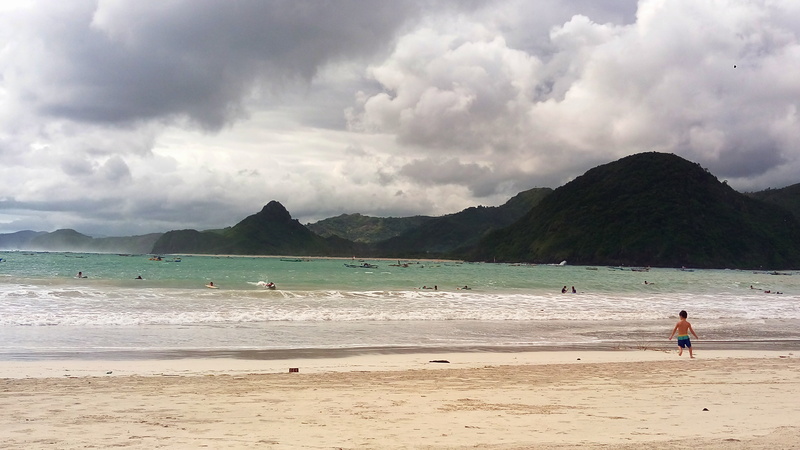 What Bali lacks, Lombok makes up for and in short, that’s precisely the charm of Lombok. How do you get to Lombok? Lombok has its own airport and if you are flying from Singapore, you can choose to book a flight to Lombok or take a flight from Bali to Lombok. Various airlines like Lion Air, Wings Air etc operate on this route (Bali to Lombok) and you can find return tickets for as cheap as 60-65 SGD. It takes only about 30-40 minutes. Lombok is also accessible by fast boat and (slow) ferry from Bali. The ferry takes quite a few hours but will cost you only a few dollars. So, if you are surely not seasick and have plenty of time in your hand, you may go for it. There are also several fast boat options but they cost as much (or more) as the flight and hence the flight is definitely a better option. Once you get off at the airport, find the several airport taxi counters to book a cab. Lombok is so beautiful that you can even spend a month or more here but one week I believe is the minimum (excluding Gili islands). Anything less than a week and you will leave with the feeling that you trip was just way too short. 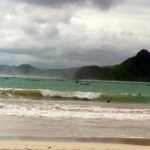 At this point, it is perhaps wise to remember that if you are coming to Lombok expecting fancy beach cafes or bars to chill at in the evening, then you will be disappointed. Lombok is amazing but only if you come for the right reasons. When people think of Lombok, they think of Senggigi or Kuta. Very rarely do cab drivers drive someone all the way to Tetebatu village. So rare is the occasion that they do not even have a fixed standard fare for it in their fare chart. This presented me the perfect opportunity to bargain. They proposed 350,000IDR and I refused to pay more than 150-175,000IDR. I calmly suggested that I would take a golden bird taxi from outside if they can’t cut down on their prices. Finally, they agreed on 200,000IDR which is a pretty fair bargain considering Tetebatu is around 1.5hours drive from the airport. Lombok was my love at first sight. 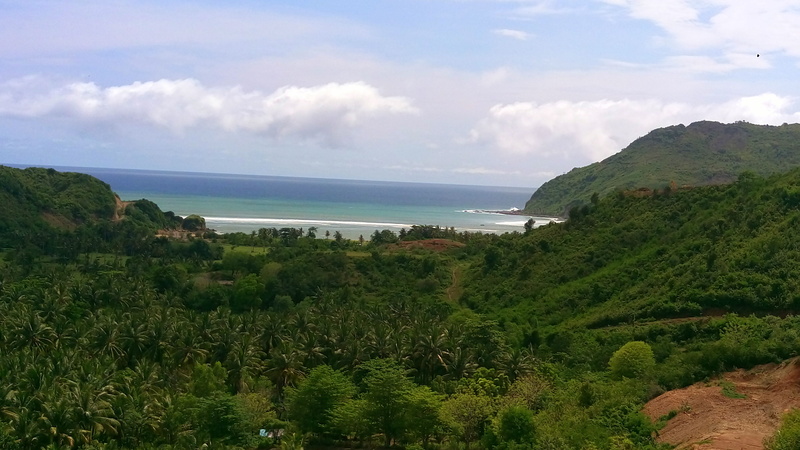 As the journey to Tetebatu continued, I began to fall in love with Lombok more and more. No sign of tourism industry, barely any sign of urbanization and lush greenery as far as your eyes can venture. 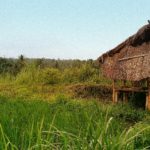 I had booked a homestay via Airbnb which was in a village adjacent to Tetebatu. As I arrived, I was greeted by a large and friendly family. The homestay was just as I had pictured- a nice little house right in front of acres and acres of greenery. I couldn’t have been happier with my choice. After a quick shower and home cooked lunch, one of the family members offered to show me around. In Tetebatu, the primary mode of transportation is bike/scooter. Since I couldn’t drive one myself, my only option was to sit behind someone else and use it as a motorbike taxi (Gojek-as its popularly known in Indonesia). Since this is a village, many things don’t work in a formal or professional manner. No cost was discussed when he offered to show me around and since everyone stayed like a family, it felt a little awkward to bring it up. Of course, looking back I realize I should have discussed it first. I sat on the bike and we went to the next few villages. 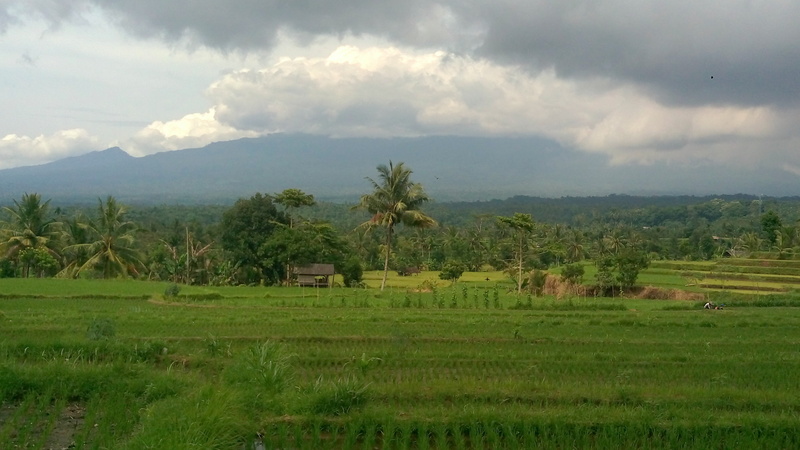 They say the journey matters more than the destination and Tetebatu will make you realize why. Passing through the countless farms and fields, as the fresh wind gushes past your face and tosses your hair around, you will feel rejuvenated and wish to continue the journey forever. 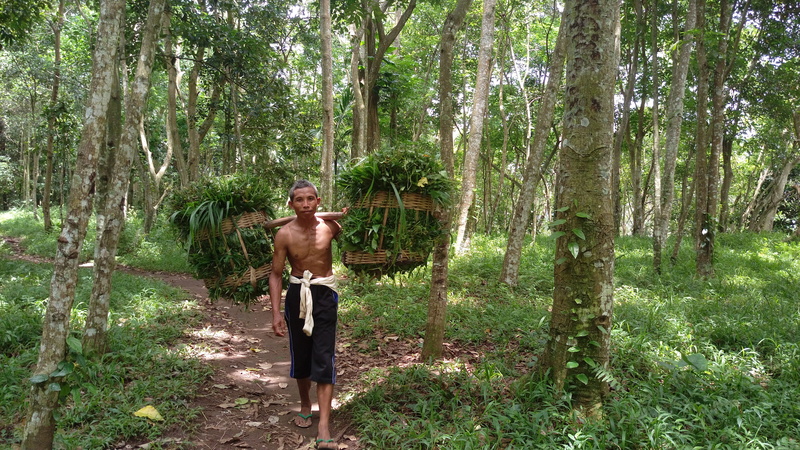 The next few hours were spent in exploring the different villages and the Sasak culture. 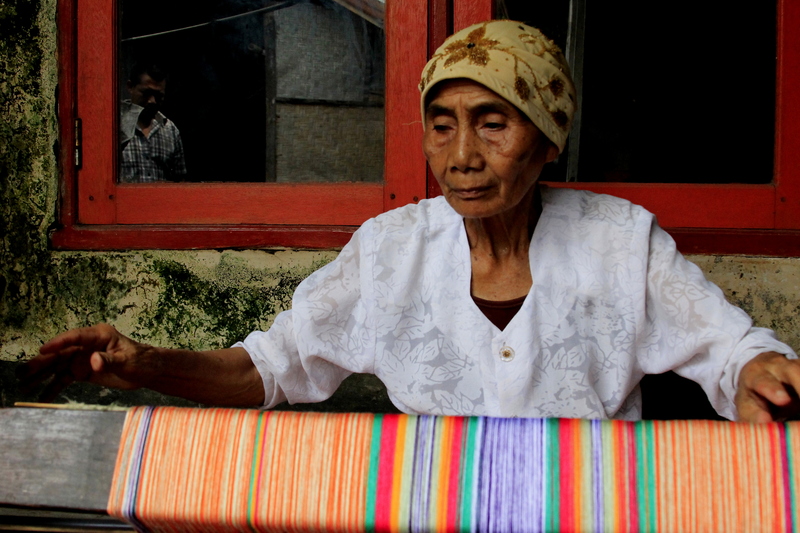 Pringasela- which is known for hand weaving and making Sarong (the traditional colourful Indonesian dress), Loyok- famous for its bamboo handicrafts, another village where they make rice wine and then a house where they dress you up in Lombok traditional costume. Most people are quite friendly but you must remember that after observing the various processes, they expect you to buy something from their shop. 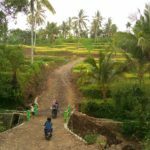 More than the processes, what I distinctly remember is the journey, sometimes through concrete roads and sometimes through broken roads amongst rice fields. Anyone who has ever considered going to Lombok would know about Mt. 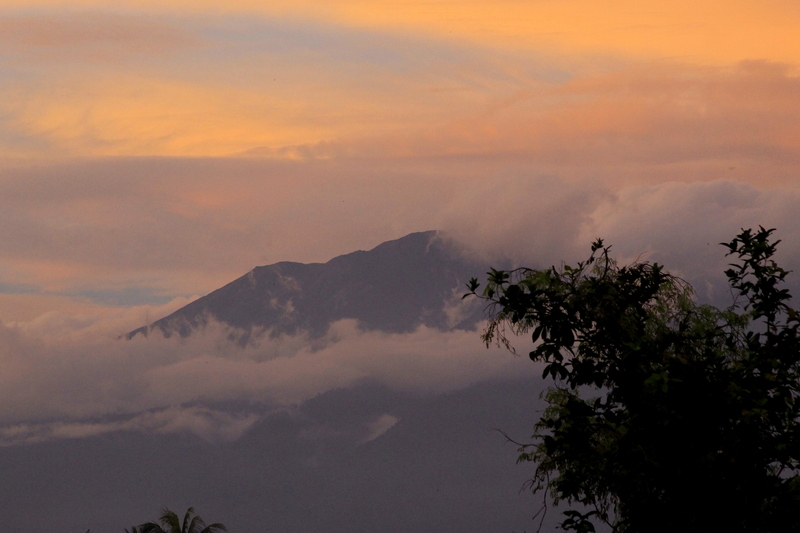 Rinjani- a trekker’s dream come true and a gorgeous volcano. I stood in the middle of a rice field and watched sunset as the clouds played hide and seek with Mt. 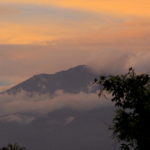 Rinjani.. Even from far, its very presence will fill your heart with joy. At that moment, I felt complete. In the middle of nowhere, I found a little piece of heaven. In the evening, there isn’t much to do in a typical village, other than sitting around and talking to each other and Tetebatu was no exception. We returned to find most of the family members sitting in the common area and some watching television. Bollywood (Indian hindi movies) is extremely popular there and the moment anyone found out I am from India, they would throw in a couple of hindi words and names of famous actors! The day ended with a few hours of hearty conversation with the host family as well as a delightful Portuguese family who were also staying there at the same time. The next day I woke up to the sound of chickens calling out and had delicious banana pancake for breakfast, which is a very popular breakfast in Bali and Lombok. Another member of the family would show me around the village but he was kind enough to mention that it will cost me. However, he mentioned extremely low amounts- 10,000IDR if I remember correctly and I decided to give him more anyway. It was monsoon and since the rain gods had shown mercy on us, we decided to seize the opportunity and visit the waterfall as the way involves walking through river and some rocks. With the blessing of bright sunshine, we started our journey. Passing through fields of onion, tomato, chilli and every possible vegetable, we soon reached the waterfall which has an entry fee of 10,000IDR. I quickly checked the entry book and seemed like I was the only non-European person who had come here in the recent past. We started our walk and soon we were passing through a small river surrounded by rocks and cave like structures. The path itself is not difficult but due to a recovering injury in my leg, I needed sufficient help from my host to finally get to the waterfall. 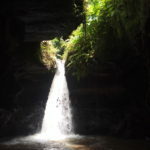 The waterfall itself was a small one but the fact that it appeared to cross at the mouth of a cave like structure and then flow down with a striking force made it quite appealing. 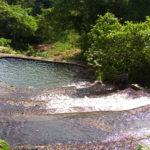 Moreover, we were the only ones in the waterfall and I fulfilled my long due desire of swimming in the waterfall. It wasn’t much of a swim as the water’s force was constantly pushing me away from the source but it was fun nevertheless. Playing around in the water in a personal cave, I did not realize how fast time passed by. Suddenly, I realized we have to visit other places. I quickly came out and changed in a small area covered by a thick cloth and headed back. 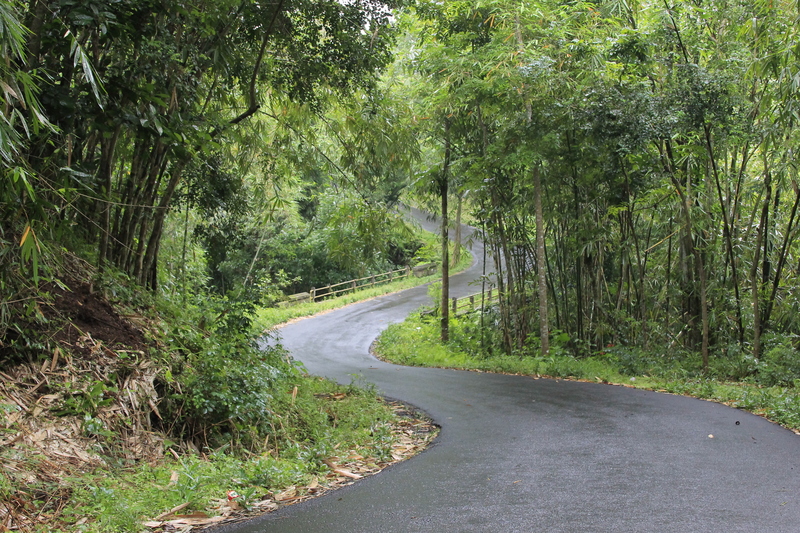 This forest is known for black monkeys but there is no definite spot for it. Needless to say, you have to venture deep into the forest for finding one. The forest itself is quite nice and peaceful for walking around. After walking for a while, my injury made it impossible for me to walk deeper into the forest and hence we decided to get out instead and leave the black monkey’s sight for another time. We did however witness part of the daily life of villagers where one man had climbed up the tree and was shaking various branches as some of the women stood beneath the tree to catch the fruits that were dropping from the branches. While sitting in a rice field, I suddenly remembered the picture of a beautiful waterfall which had caught my eye at the airport. 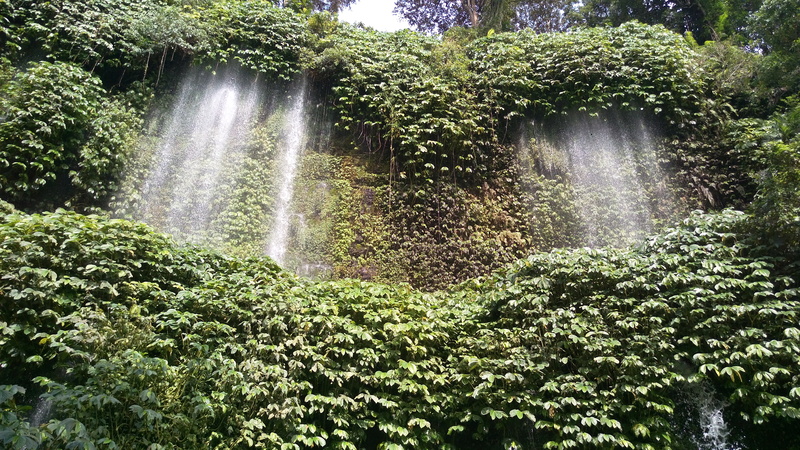 My host then informed me that the waterfall was about 1 hour away by motorbike. On my request, he agreed to take me there after a quick lunch. As we started our journey, I couldn’t help but feel the joy of being in the heart of mother nature. In Lombok (especially tetebatu), mother nature is everywhere, all around you. Everywhere you look, your eyes will see the pleasant typical beauty of an unexplored and lovely village. After one hour of bike ride, we finally reached the waterfall. 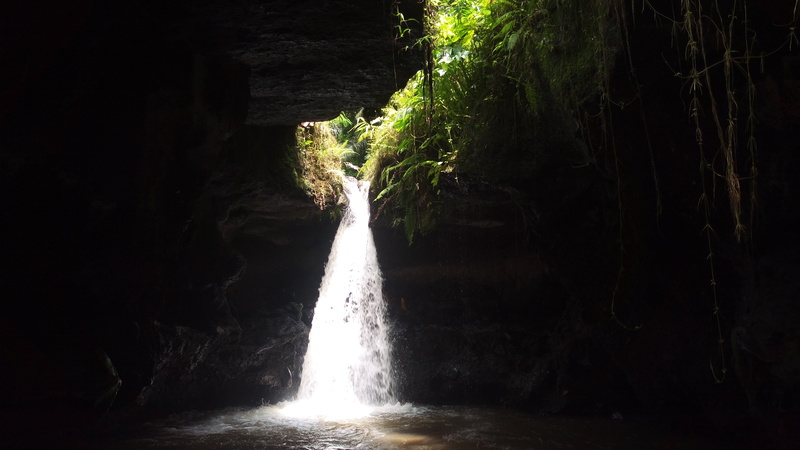 In fact, it’s a national park with multiple waterfalls but Kembung waterfall is the only one that’s accessible without a hike. The entry is slightly expensive as compared to the other areas of Lombok but it’s absolutely worth it. You can walk all the way to the waterfall but its recommended to take your bike as there is a parking near the waterfall. As you walk down the steps to reach the waterfall, you realise, it’s in fact a bunch of waterfalls and not one. The whole scenery appears as if water is flowing from the trees itself and down the rocks and steps. I even managed to catch a light rainbow in front of one of the waterfalls. Sitting there, gazing at this unique combination of trees and water, I can’t even begin to tell you how calm my soul felt. 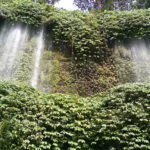 If there is one thing you must absolutely not miss in Lombok, it is the Benang Kelambu waterfall. You can spend hours just lazing on these steps or dipping in the water under the sun. The best part- it wasn’t even crowded! 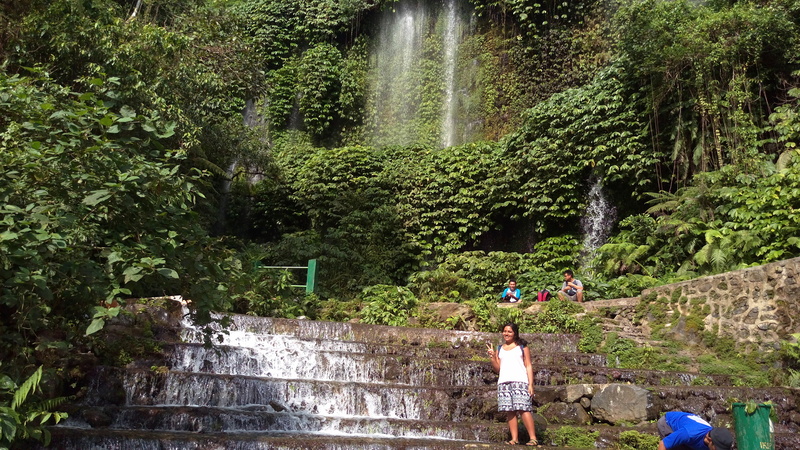 I wish I could have visited the other waterfalls too but due to my injury, I had to restrict myself to this one only. We finally made our way back and spent the evening drinking local coffee (without milk) and watching the coconut oil making process. Remember, after observing the lengthy process, you have to pay them for it! 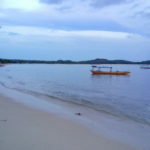 I slept early as I had a ferry to the Gili islands the next day early morning. The harbour (Bangsal) is nearly 2 hours away! So, plan your trip accordingly if have limited days. 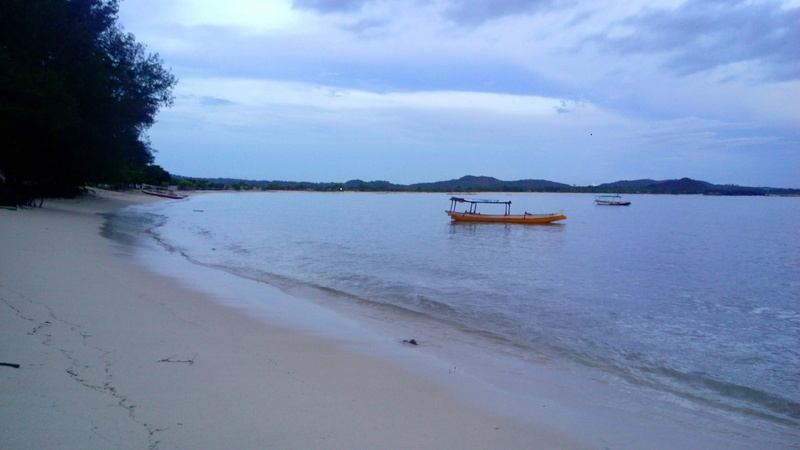 I did return to Lombok after a day’s stay in the Gilis (due to my bad planning of course). 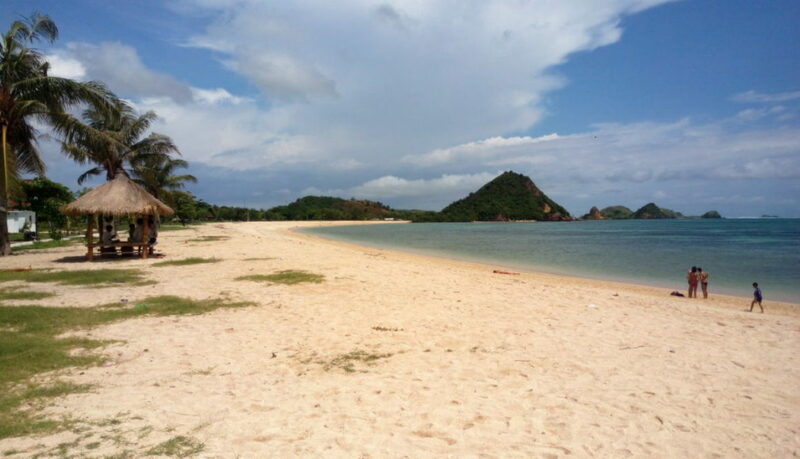 Hence, the following part is about the sun-kissed beaches of Lombok. As I arrived from Gili Air, my new host received me at Bangsal harbour and drove me this place. Andy’s place is right opposite kuta beach and if you get out and cross the road, you land right on the beach. It’s cheap, clean and perfectly located. I quickly freshened up and jumped across the road to the beach. 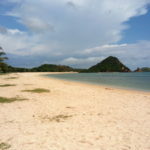 Despite being one of the well-known beaches of Lombok, it is barely crowded and boasts of impossibly beautiful waters. On sunny days, you can catch a hundred shades of blue and green being reflected on the water. 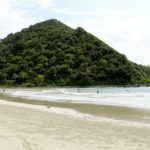 Most of Lombok’s beaches are surrounded by small hills, thus giving them a very unique feel. The water is clear and you can swim here or just lay by the beach. 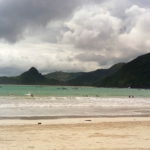 Because I had only one day to cover all the beaches, I went beach-hopping! 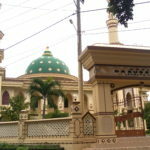 My next stop was Selong Belanak. My host drove me there on a bike and mentioned it’s one of his favourite beaches. As usual, the road was covered with aesthetically pleasing sights. 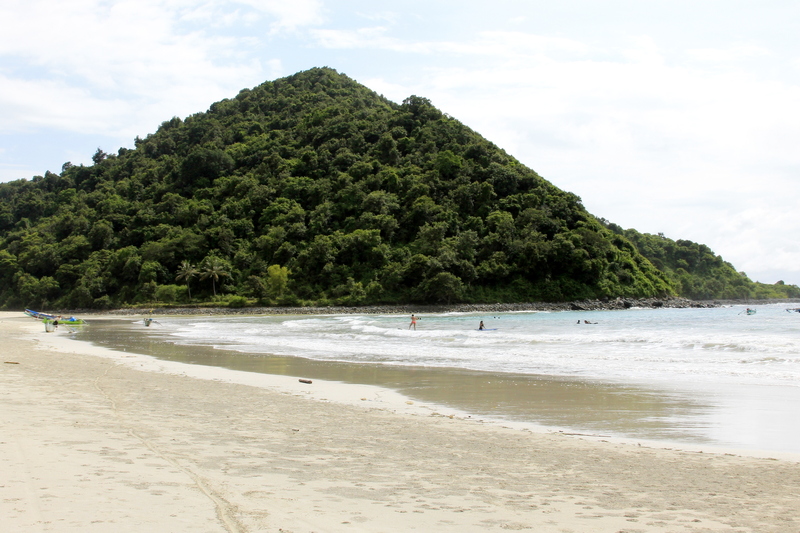 Selong Belanak is a good beach to learn surfing or just soak in the sun. The water isn’t dirty but there are a number of boats in the water. Surrounded by hills on all sides, the area seems like a shot right out of a movie set. I sat on one of the beach chairs and enjoyed a cheap lunch and drink. I finished my story book, as I lay there soaking up the sun after lunch. Suddenly, it began to drizzle and I rushed back to find my host. One can also hike up the small cliff on the side for some wonderful shots. We were on our way back when the rain hit hard and drenched every bit of us. Luckily, I protected my camera and phone with my waterproof jacket but as a result, both of us were soaking wet by the time we reached home. I freshened up and prayed the clouds would drift away and give us a clear sky. Well, as they say, when you want something from the bottom of your heart, even luck takes your side. This time, we took a car and headed over to the last beach for the day. White sands, blue water and absolute peace. That’s my impression of Tanjung Aan. 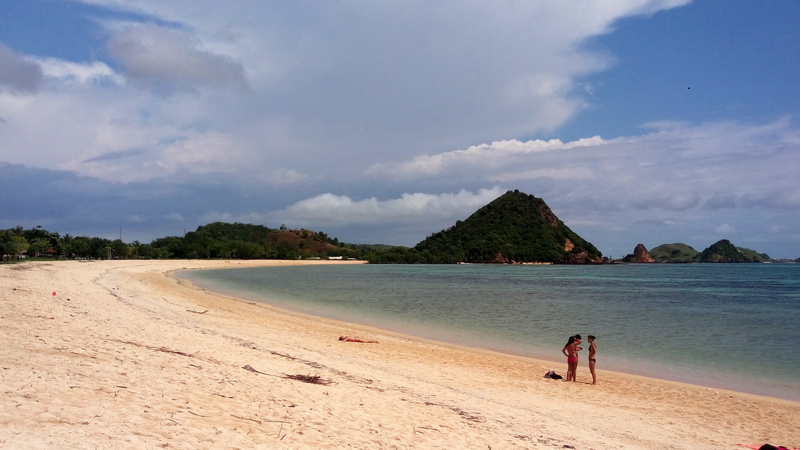 While Selong Belanak’s beach is spread over a long stretch surrounded by hills, Tanjung aan is comparatively smaller. Unfortunately the sun was already down by the time we got there but it’s a perfect getaway if you want a cosy and nice beach. Most of Tanjung Aan hasn’t been developed much and hence lesser crowd than Selong Belanak. There is a cliff right beside the beach and on sunny days, it would be a perfect spot for sunset! 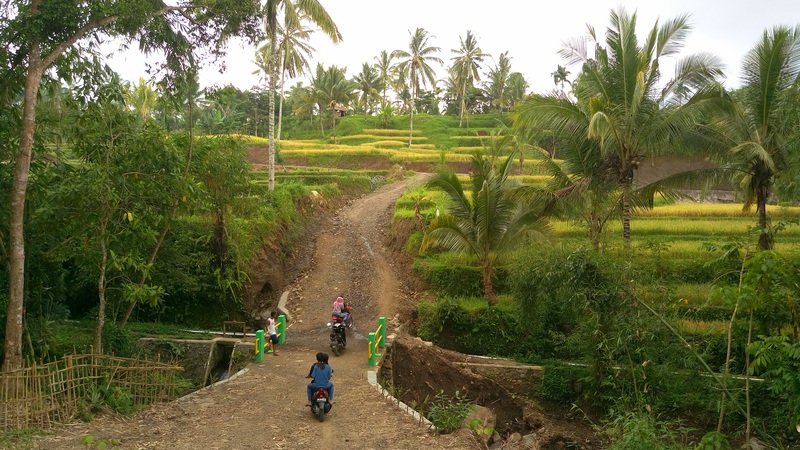 It is also wise to note that the road to Tanjung Aan is best covered in daylight as many travelers choose to bring their motorbike/scooter here. To be honest, this was my least favourite beach in Lombok. It wasn’t dirty but for some reason it’s beauty did not attract me enough. I only made a quick stop here on my way to Selok Belanak. In some ways it looks similar to Selok Belanak and yet Selok Belanak has a better feel. In Lombok, there isn’t much of a nightlife and hence I took up the opportunity to pack my bag and then divulge into a long lasting conversation with my host and his future plans. The best part about homestays is that you can really get to know the local way of life and that’s wonderful. Their thoughts, their dreams, their lifestyle..all of it. It is during these very hours, your horizon broadens, you start understanding different mentalities and thought processes and grow as a person. It is a beautiful thing, perhapsas beautiful as truly understanding yourself. The next day, as I waved goodbye to this mesmerizing place, I felt a deep sense of lose, as if I was leaving behind a part of me in this island. I glanced at Mt. Rinjani one last time and promised to return soon. The moment I left Lombok, I wanted to scream and tell every nature lover and backpacker to head over to Lombok right away! So, here is me, screaming out loud in writing. Go visit Lombok! 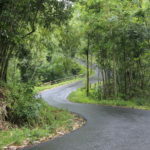 Go before tourism industry takes over and destroys its natural beauty. If you are looking to chill in fancy cafes by the beach, don’t go to Lombok. If you want luxurious hotels with sea view rooms, don’t go to Lombok. If you want a great nightlife or fancy tourist activities don’t go to Lombok either. But, if you are a nature lover, if untouched, raw nature is what calms your soul, if you are a backpacker and can live without a few luxuries, then I urge you, give this island a chance and you will come back with some soulful memories. Remember most of the processes that they show you can be chargeable. 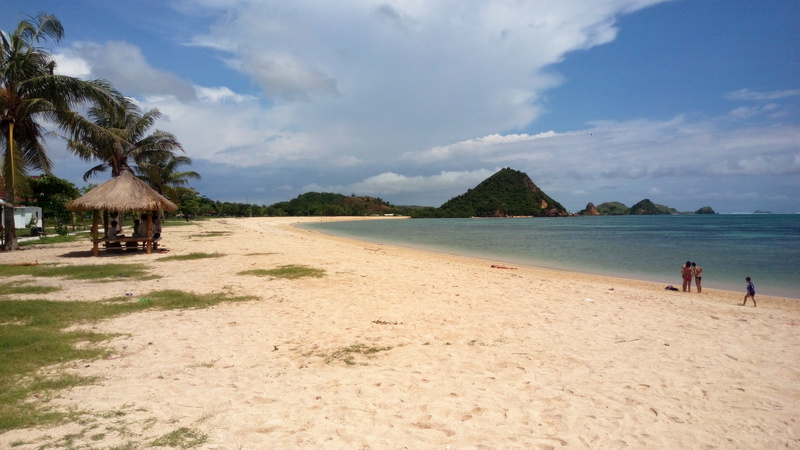 The beaches of Lombok and Bangsal harbour are really far from the village. 2-2.5 hours. Hence, it is wise to keep that in mind while planning an itinerary. Tetebatu is quite pocket friendly but the people do need money. Do tip generously if you can afford it. The village is quite safe for solo travels but there is nothing to do after sunset, except chatting up the locals. Wifi connection may be quite weak. It helps if you purchase your own sim card and data plan. The roads can get extremely bumpy and rough. Don’t worry, the locals are great with their motorbikes. I had a wonderful experience staying at Makbul’s place. If you wish, you can do the same and book via airbnb. 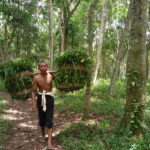 Search for sasak traditional style room and Makbul as your host. First and foremost, you might notice the lack of mention of Mt. Rinjani as a must visit place in my article. Unfortunately, I did not have the fortune of trekking Rinjani but if you can, it is the first thing you absolutely must do! Lombok is a cash economy. Carry cash and it helps! Public transport is almost zero in most places of Lombok. The little busses that do run will not take you to most of the beaches or the villages. However, car hires (with drivers) and bike rentals are available and if you stay with a host, you can pay him to drive you around in a bike or car. 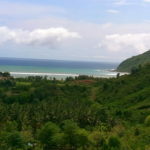 Senggigi is the most popular destination in Lombok but due to its popularity it may be more crowded. Remember, Lombok has a rainy season and it rains unexpectedly from time to time. December is also rainy season. Plan accordingly. There are not too many food options as only local food is available due to a lack of tourism influence. Lombok can also be accessed from the Gili islands via boats. Andy’s place was the perfect accommodation for me. 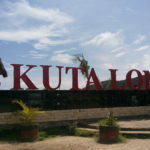 If you want to stay a his homestay, search Big Bed at Kuta Lombok and find Andy as you host. And Lastly, Lombok isn’t exactly a tourist spot yet. Come with the right expectations and you will be amazed at what you find.